We were told by a fellow traveler that the return rate to Morocco is about 6%. That means that 94% of people who travel here find it undesirable to return. As we swelter in the heat, pressured by locals to constantly buy hash and, for the first time on our trip, worried about the safety of the food, we empathize with this statistic. This is the first country where we have gotten sick. It may have been the spleen we ate in the Marrakech Djemma al Fna square. As adventurous as that may sound, we have tried far scarier food in far more suspicious environments. Having a beer and raw egg smoothie in the meat market of Iquitos, Peru has to be high on the list. 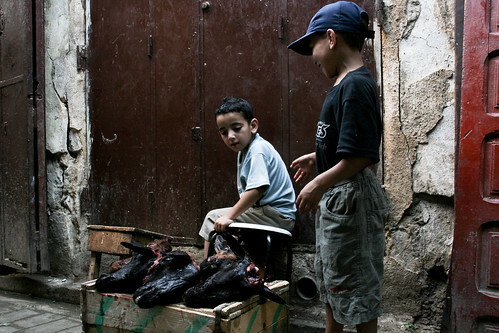 But there is something careless about the way the Moroccan people seem to leave meat, dairy and vegetables in the sun; nothing ever seems to be cleaned with anything more than newspaper or wax paper. 3. If you feel your arm grabbed, you need to shake it loose fast or you may be ambushed by henna. The fee negotiations start at $40. Actual price of voluntary henna is about $2.50. 5. Locals who won’t leave you alone, despite repeated protests, will sometimes demand a fee. For guiding you, of course. 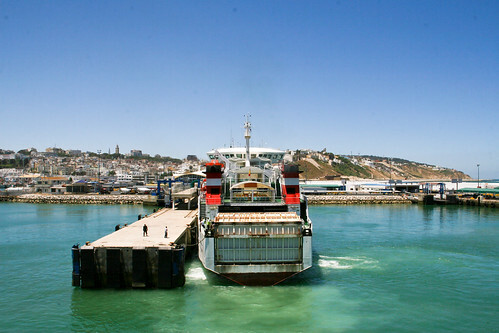 To arrive in Morocco we took the ferry from Tarifa in the South of Spain to Tangier. At just over $50 US it isn’t cheap, but it’s nearly priceless to travel for about half and hour and end up in a completely different universe. To return to Spain later, we booked a cheap flight ($70) on Easy Jet from Marrakech, our final destination, to save time and money on backtracking to the coast. 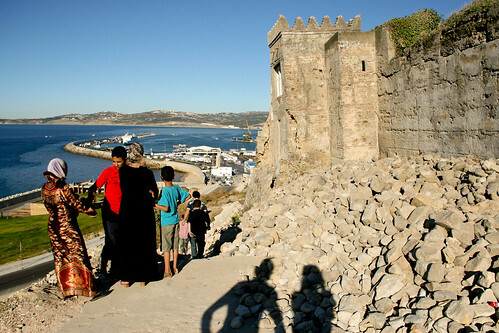 Many fellow travelers had warned Tangier was sketchy and filthy, a sort of Tijuana of Europe/Africa. In reality, we had quite a good time. It’s a small city, all the major areas of old town quickly walked. But we felt safe there, and spent more time smiling than ever before. People were friendly and warm, clever with their English and Spanish, and everyone beckoned us to their shop or home for tea. 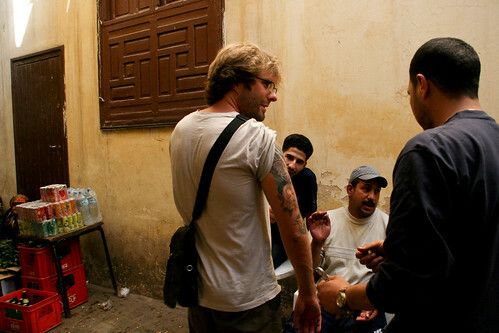 It was a good start for us in North Africa, falling asleep happily to the sounds of the bustling city. 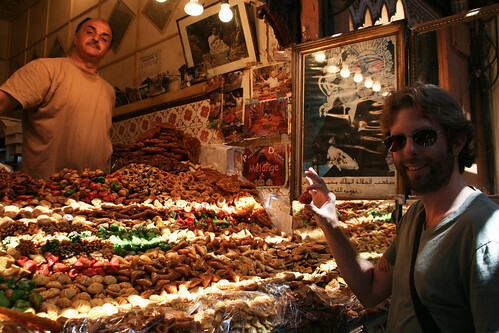 We finally found the crazed, raucous markets we longed to see in our first destination, Fes. 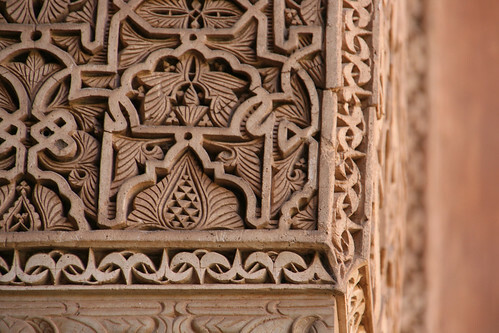 On our itinerary, Fes is the largest city we would visit — it’s medina the largest in the world. First things first, we followed signs for places to stay but found nothing but overpriced, run down walkups and high dollar gleaming riads. Kids are always intent on getting into the action, and we asked one boy to take us to a clean, cheap place to stay. 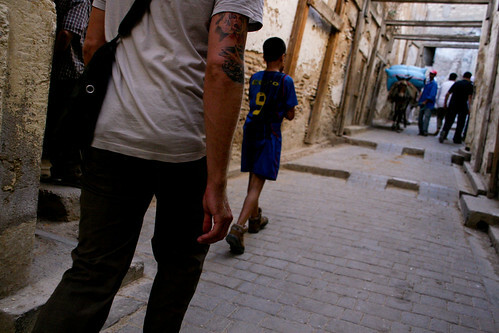 During our time in Fes we would repeatedly hire little children to find a path through the maze of the medina — for a few dirham (10, 20 cents) they’ll run ahead of you always confident, usually successful in finding specific restaurants, businesses and exit gates to the medina walls. 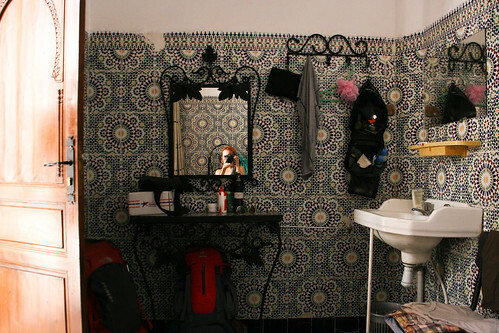 We stayed in the small, narrow home of a young Moroccan family who was also hosting a student from California learning Arabic in Fes. The language barrier kept us from most conversations, but being amid the atmosphere of a home, rather than hotel, was a welcome change. The cost was about $15 US a night, with tea and small breakfasts. 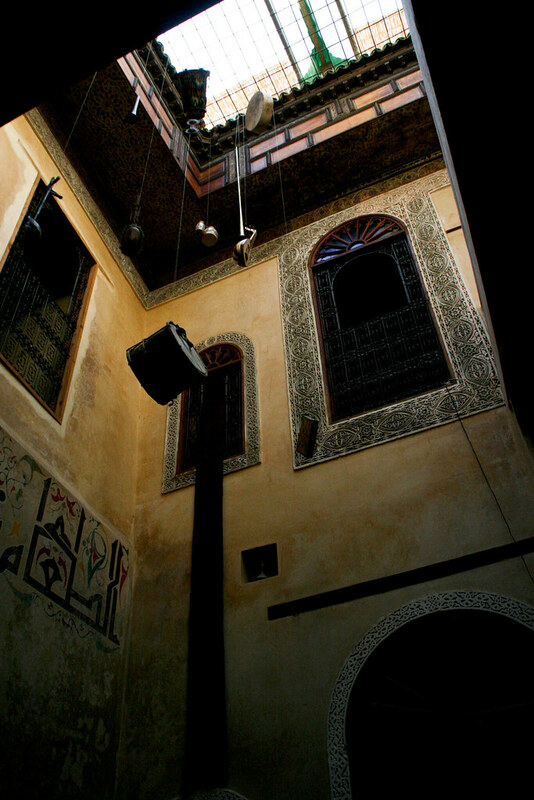 In Fes we hardly ever left the medina, losing many hours to it’s ever-changing charms. 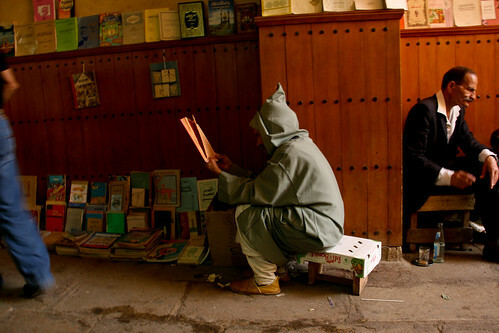 Always a new workshop, cats playing in the dirt, children selling goat heads and minarets ringing with calls to prayer. There is a kind of beauty hidden in this chaos. Not everyone who calls out to you is trying to sell something and a friendly Moroccan is a very good hearted human. They are an intimate people, raw with emotions that often explode in fights but more often with smiles and invitations to come chat or have dinner with their families. 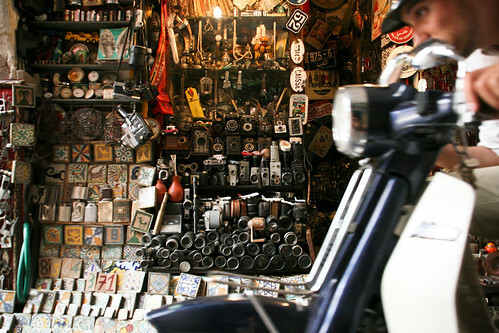 We ducked into a small antique shop to lose a particularly aggressive “guide” who was moving towards sexual predator with Eva — and ended up spending nearly two hours with the owner as he made us tea, invited us home for dinner and reminisced about the 60s American rock culture that had invaded Morocco. It turns out, Jimi Hendrix was asked to leave the country after he tried to buy an island and fill it with drugged-out hippies. There was a short debate whether we should take an excursion out into countryside. There are plenty of Camel trips that can be arranged where you explore the desert and villages. However, a fellow traveler described the villages on his trek as so poverty stricken they appeared “war torn” and the locals had taken to wearing plastic garbage. We were still curious until we had found out the temperature out there had been over 125 Fahrenheit. Maybe next time. 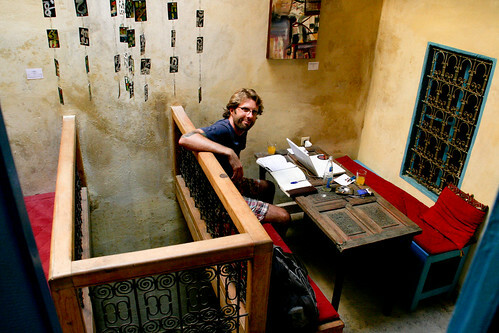 For sanity and tasty snacks we fell in love with the Cafe Clock in Fes. 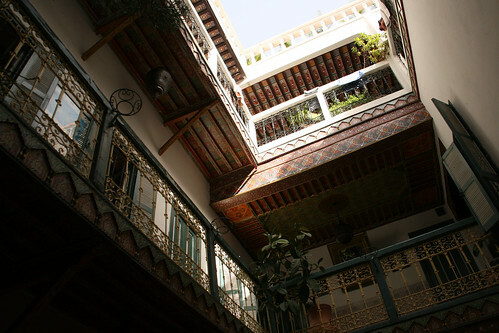 Run by a talkative, older British ex-pat, this place was our oasis in the medina. Stylish, packed with books, the Clock offered daily diversions such as yoga, and calligraphy classes. The staff didn’t require bargaining for coffee, there was plenty of private nooks to spread out in and take advantage of the wifi for a few hours. To the owner of the Cafe Clock: we are eternally grateful! A set of friends traveling to Morocco from France provided some company if not a little comfort from the chaos for the first day in the city of Marrakech. Lovely and tirelessly cleaned Hotel Essaouira, packed with backpackers from around the world, provided a good place to stay for only $10 a night and for only $2, you can sleep on the roof. 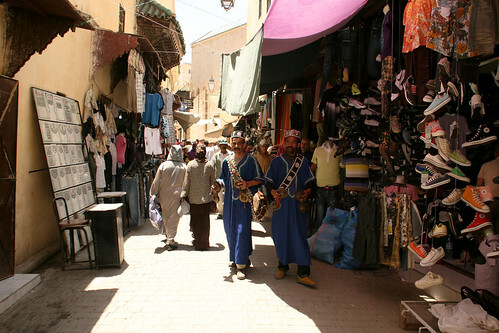 The rest of our days were split between enjoying the thrill of the medina, and visiting Marrakech’s many important sites. The oldest palaces have been stripped and stand unrestored. Some are being used by locals as bathrooms, and are just a sad sight to behold, but others, such as the Saardien tombs, give a glimpse of their once ornate decor. In the end, it’s not the badgering for drugs, or the unclean food, or even the snarky people that make us cringe a bit at the thought of Morocco, but rather the loss of a traveler’s privilege to view a culture at arms’ length. So far our travels have allowed us to dictate how involved we get with each culture, mostly walking into the welcome arms of South Americans and Europeans. Moroccans don’t give you the space to walk amid their bustling medina and take it in at your leisure — they will confront you, push, pull and amaze you. We left home looking to be inundated with the new, the foreign, and now we’re a bit surprised at how testy it can make us to be stripped of the control and “choice” we feel we typically carry with us. But travel isn’t about distance. Being faced with this now is a bit of a practice run before we make it to Asia, where surely our personal space will be infringed on in new and cleverer ways. We learn every day to reflect open-mindedness and patience (is this the zen of travel? ), and see beyond the personal barriers most people privilege themselves with back home. We’re surprised at what we find in ourselves – good and bad, and what we can accomplish. In Venice, for example, everyone was intent on selling us something — a gondola ride, a pair of boxers imprinted with the private regions of the David, or Murano glass — and we couldn’t escape. We kept trying to find the people who worked, sold produce, went to the pharmacy, and sent their children to school but could not find them. Normally, we are the silent observers of a culture; in Venice, we felt like the watched and prodded animals in a zoo. It’s an uncomfortable feeling. Enjoyed reading this post. We visited Morocco for a second time this past spring. We’ve thouroughly enjoyed our trips and hope to return at least once more in this lifetime. I don’t agree with most of your observations but is it always good to read someone else’s perspective. You might have enjoyed getting out of the cities and travelling far out to the countryside and of course a night in the dunes. Totally agree with all your tips on Morocco! Fantastic photos too, they took me right back in, especially to Cafe Clock. I’ve just posted the pics from my cooking class there – thanks again for the tip-off! I’ve lived both in Asia and North America. In Asia (as in most tourist-driven third world country, I guess), badgering and soliciting that’s bordering on harassment is quite common. It doesn’t only happen to travellers; it happens to locals as well, albeit in a different situation but same goal – getting your money / your attention. Living is Asia, I have been bullied by cops asking for some coffee money; robbed by wannabe-goons while waiting for the bus; threatened with a gun when I (unknowingly) parked at a local gangster’s parking space. In North America (Canada), people are polite, they get out of your way, privacy is tops. My husband was born and raised in Canada and had never lived anywhere else. He found Marrakech a bit unsettling because of that “in your face” attitude. He also felt the same way about Vietnam and the Philippines, where people seem very aggressive. I love the aggressiveness in cities like Marrakech, Hanoi, Havana, Manila, Hong Kong, Venice, etc. because I grew up in a similar environment. Knowing how to deal with the situation meant survival. Meanwhile, my husband still feels a bit uncomfortable when confronted with such matters. 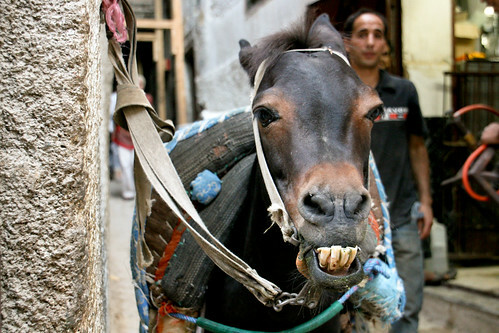 Poor donkey, it’s got to be hard enough being a donkey without being ugly! So beautiful gardens, I’ve decided to go morocco for summer holidays. Price is reasonable there. & also plane ticket is so cheap. So I am getting information for visiting. Nice blog, thank you for sharing this. Thanks, it was exactly what I was looking for. Please share more with us. 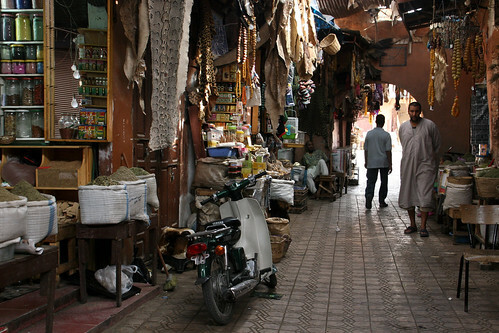 Thanks for the tips, i’m planning a trip to Morocco from NYC in 2011. It’s amazing how some parts such as the market and the locals trying to sell you everything but the kitchen sink are similar to PEru. I was there a few months back and had similar situations happen to me. IF you ever plan on going to PEru and visiting Machu picchu, cusco, the nazca lines etc.e tc. try http://www.perurooms.com they get great prices on everything even if you plan on couch surfing!! I felt this frustration when we first visited Morocco; I was scammed into bad henna as a ‘gift’ and then paid more than I wanted for it, and I was just so irritated and annoyed with myself and the constant push and pull than I went back to our riad and cried. Our general politeness was often taken for granted – but not always. We’ll go back to Morocco – we loved it – but I loved reading this post. You evocatively describe what it’s like to deal with Moroccans who are trying to hustle. We’d be doing the same if we were them, but it’s still a tough go sometimes. whatsoever. So ,, whenever We choose a comparable write-up My partner and i simply hope the dog owner embeds a few internet training video a place.